Did you get Samsung Google Motorola Moto G? That's great because this device is having nice specifications, but what about rooting it? Then it will be ICING ON THE CAKE! Then, you can try hundreds of things that only rooted users can get on Android. I know you might be thinking of the risk, then I must tell you that this is a very simple and a noob-proof guide. Anyone can do this. You just require some basic things like ADB (to reboot, if you don't know how to reboot it to bootloader/fastboot) and a computer, and fastboot for unlocking the bootloader. After the bootloader is unlocked, we can proceed to our main guide, i.e. How To Root Motorola Moto G. Without rooting you cannot enjoy the Android device. In my home, every device is rooted and that's fun because after that I can run the games flawlessly on some of my old devices like Micromax A87 Ninja 4.0, my other devices are high-end but still, I enjoy some applications like Xposed Module Installer with cool mods like Gravity Box, Xprivacy etc. Not only Xposed, there are many many things which will make your Android device best in your friends! The device is high-end with some bright specifications like Quad Core 1.2 GHz Cortex-A5 Cortex-A7, GPU: Adreno 305, Snapdragon 400 Qualcomm chipset, 1 GB RAM, 4.5 inch IPS LCD DIsplay and that's all for rupees 11158 (180$). That is cool, but you know that you can try some damn cool ROMs like CyanogenMod 11 (let developers build it first, that's the best ROM, believe me.) etc. Rooting simply means getting superuser permissions so you can edit the main system files (like System and Data). As I said, rooting is just easy. Just some commands to unlock bootloader and a script and woh! it's rooted. It won't take more than 10 minutes to unlock the bootloader and root it. The device has already got Android 4.4 Kit Kat update, and that's the best thing about Motorola, not like Samsung! Samsung usually releases update after more than 1-4 months of the release of the Android update which users can already get by Custom ROMs. ADB and Fastboot: You can get this easily from the internet but they are of huge size but I have compressed it for you, and that's only for 500 KB! Original size is more than 400 MB actually, so simply download it from here: Click HERE to download my compressed ADB and Fastboot. A computer: You just need it to use ADB and Fastboot. USB Drivers: Click here to download them from the official Motorola website. Just install them and accept all the warnings! USB Debugging: Go to Settings>About Phone and tap on Build Number 7 times so it will enable Developer Options. Click back and there will be a new option Developer options there. Open it, enable it and enable USB Debugging too. 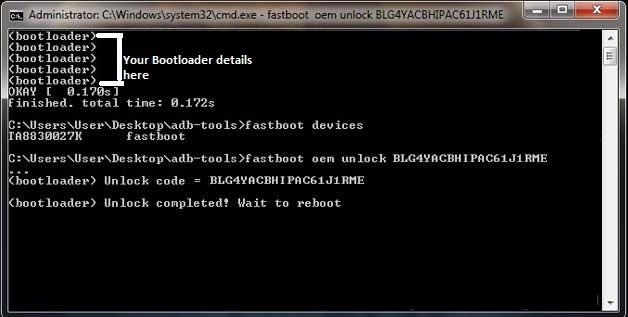 Unzip the ADB and Fastboot which you recently downloaded to your computer. Press and hold Shift and press Right Click on the folder in which you extracted the files. Now click on the Open command window here option. CMD will open soon. Type fastboot oem get_unlock_data and press enter. Open This webpage and enter your email ID and sign in. There enter your Bootloader details which you got from the CMD. ENSURE THAT YOU DON'T ADD ANY SPACE IN THE CHARACTERS. In the website enter IHJFDHUDHDSUFHSUFHDSFIGHFIGHIHDUFHUFGHFUGHFUGHFUGHFUGHFHUHGFUGHFUGHFUGHFIGHFIGHFIGH. I hope you got that. Click on Can my device be unlocked? and click on I agree on the bottom of it. Now open the email which you registered with Motorola and you will get a code in it. Copy the code and open the command prompt window. Type "fastboot oem unlock YOUR 20 DIGIT CODE HERE" and press enter. Wait few seconds and it will reboot itself. Now let's see how you can root this device. Switch off your device after the reboot. Press and hold Power button + Volume Down buttons simultaneously for some time until the screen glows. Now you will be in the Bootloader mode. Connect it to PC again via USB cable. Double click on superboot-windows.bat file. It will root your unlocked device soon and will reboot itself. So it was an easy process I think? Having any problem? Shoot a comment here. I am there to help you. I'm entering fastboot OEM get_unlock_data in the CMD window and it says, (waiting for device). How long should this process take or is there something else I need to do?